Defending Marathon champion Des Linden has been busier this year after an onslaught of invitations, promotions, and appearances. 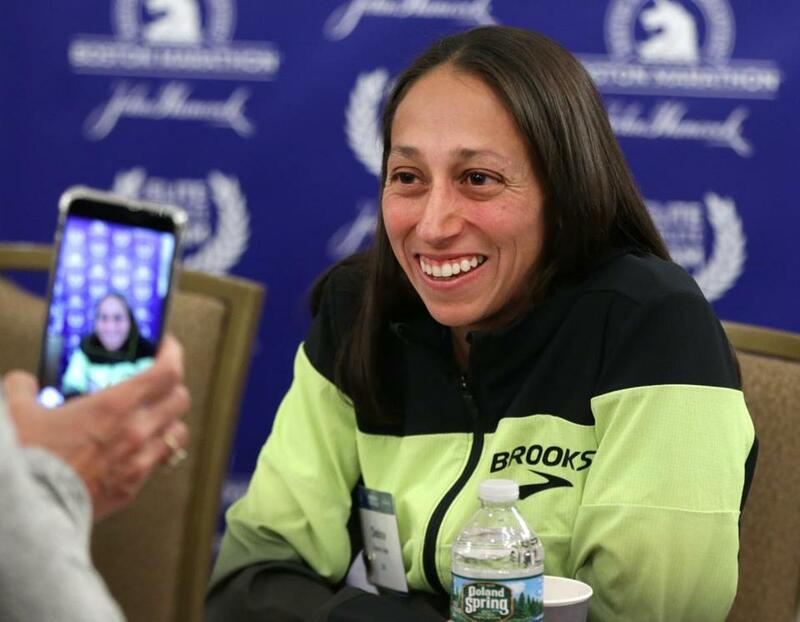 It had been 33 years since an American woman stood atop the podium at the Boston Marathon before Des Linden broke away at the 22-mile mark and ended the drought in 2018 despite miserably cold conditions, assisting a teammate to catch up after a bathroom break, and even contemplating dropping out. With the forecast calling for rain again on Monday during the 123rd running of the historic 26.2-mile race, Mother Nature seems to want to test the will of the runners again — leaving Linden a favorite a year after her iconic win. “I hope I don’t wake up and it’s actually 2018. That would be the worst to have to do that again,” Linden said. No woman has been able to defend the Boston Marathon title since Kenya’s Catherine Ndereba won it back-to-back in 2004 and 2005, making a repeat for Linden a monumental task. Last year’s victory put a cherry on top of the 35-year-old’s career, allowing her to relax a bit and use her experience of the race and terrible New England weather to dictate the outcome. Linden finished sixth in the New York City Marathon in November (2:27.51) and fifth at the NYC Half Marathon last month. “It is a little bit busier. I’ve got a lot more to do [since I won Boston],” Linden said. One of Linden’s biggest competitors will be another American, Jordan Hasay. Hasay had to pull out the day before last year’s race due to a stress fracture in her heel; a broken bone in that same heel left the 27-year-old unable to compete in the Chicago Marathon. In 2017, Hasay ran the fastest ever debut time by an American woman (2:23:00) at Boston, and topped that in Chicago the same year by becoming the second-fastest US woman of all time on that course (2:20.57). A half marathon in Rome last month marked her return to competitive racing, but her performance on Monday will certainly revolve around the health of her foot and how well she remembers the rigorous course. “The course is very downhill, so I remember at 6 miles my quads were already burning and I thought ‘Oh this is going to be a long day,’ but then you kind of recover,” Hasay said. Sara Hall, Sally Kipyego, Lindsay Flanagan, Becky Wade, Sarah Crouch, and Sarah Sellers finish out the rest of the US elite women, all of whom have personal best times under or around 2:30:00. Outside the American field, former Boston winner and two-time world champion Edna Kiplagat of Kenya will look to improve on a ninth-place finish in 2018 (2:47:14). Kiplagat took home the Boston crown in 2017, but the conditions last April provided a tough obstacle. Even at 39 years old, Kiplagat figures to be in the hunt after she clocked a 2:21:18 at the Berlin Marathon in September. She brings experience to a course that shows no mercy. Another Kenyan, Betsy Saina, who finished fifth in the 10,000 meters at the 2016 Olympics in Rio, is looking to continue what was a successful 2018 marathon campaign. Saina won the Paris Marathon, the first she ever completed, with a personal best 2:22:56 and finished eighth in Frankfurt (2:24:34). A half-marathon tune-up to begin this year in Japan yielded a personal best of 1:07:49, and has Saina possibly ready for the spotlight. Mare Dibaba of Ethiopia is returning to Boston, where she placed third in 2014 and was runner-up in 2015. The past three years, she has opted to run the marathon in London instead. Countrywoman Worknesh Degefa became the fourth fastest woman of all-time with a time of 2:17:41 at the Dubai Marathon in January, finishing second by 33 seconds. Degefa’s personal best is two minutes faster than the next woman in the field.